Cerebral aneurysm repair involves corrective treatment of an abnormal blood-filled sac formed by localized expansion of an artery or vein within the brain. These sacs tend to form at the juncture between a primary vessel and a branch. If the vessel involved is an artery, the lesion is also known as a berry aneurysm because of its round, berry-like appearance. The purpose of the surgical treatment of cerebral aneurysms is to isolate the weakened vessel area from the blood supply. This is commonly done through the strategic placement of small, surgical clips to the neck of the lesion. Thus, the aneurysm becomes isolated from the normal circulation without damaging adjacent vessels or their branches and shrinks in size to become undetectable, a process known as aneurysm obliteration. Cerebral, or brain, aneurysms occur in about 2% of the American population. An estimated 15–33% of these patients have more than one aneurysm present. Occurrence of certain other medical conditions appears to increase the chances of developing aneurysms. These conditions include polycystic kidneys, systemic lupus erythematosus (SLE or lupus), and Ehlers-Danlos syndrome (EDS), a genetic disease that affects collagen, which is a primary component of connective tissue. Aneurysms in children are very rare, strongly suggesting that the condition develops, enlarges, and becomes symptomatic over a person's lifetime. Other less frequent causes of aneurysms are infectious material from the heart, trauma, brain tumor, and brain arteriovenous malformation (AVM), a defect of the brain's circulatory system that results in the abnormal direct movement of blood from the arteries to the veins of the brain. The average age of cerebral aneurysm rupture is in the fifth decade of life and occurs more often in women than men by a slight margin. Environmental factors known to increase the chances of aneurysm development and rupture are cigarette smoking, excess alcohol consumption, and atherosclerotic heart disease. Some families have a definite genetic predisposition; in such families, aneurysms may run as high as 10%. Cerebral aneurysms become apparent in two general ways: from rupture followed by bleeding within the brain, or from enlargement and compression on surrounding critical brain structures, which leads to symptoms. The most life-threatening presentation is bleeding and is often described clinically as subarachnoid hemorrhage (SAH), a term derived from the anatomic area of the brain that becomes contaminated with blood when an aneurysm ruptures. The surface of the brain is covered by three thin membranous layers, or meninges, called the dura mater, the pia mater, and the arachnoid. The dura mater adheres to the skull, while the pia mater adheres to the brain. The arachnoid lies between the other two meninges. The space between the pia mater and the arachnoid is known as the subarachnoid space and is normally filled with cerebrospinal fluid. SAH occurs when blood leaks into this space, contaminating the cerebrospinal fluid. About half of all SAH result from a ruptured cerebral aneurysm. short-term loss of consciousness, neck stiffness, back pain, nausea or vomiting, and an inability to tolerate bright light. Sometimes a seizure can occur. About 40% of patients have symptoms and signs prior to the actual rupture, including minor headaches or dizziness, which are thought to result from swelling of the aneurysm or minor bleeding that occurs prior to the full rupture. Unfortunately, many of these events go undetected. Rupture of a cerebral aneurysm is an emergency situation. About 10% of people with SAH die within the first day, and without treatment, 25% succumb within the next three months. More than half of those who survive have significant neurological damage. Partial paralysis, weakness, or numbness may linger or be permanent, as may vision and speech problems. When SAH is suspected, a computerized tomography (CT) scan is performed to confirm the diagnosis by visualizing the bleeding. The aneurysm itself is only rarely seen using this test. CT scanning is positive (detects the bleeding) in more than 90% of patients within the first 24 hours after the event, and for more than 50% within the first week. As time goes on, however, the bleeding becomes harder and harder to detect using this imaging method. If no bleeding is detected, a second test that could be performed is a lumbar puncture (LP), which involves drawing cerebrospinal fluid through a needle from the lower back of the patient. If SAH has occurred, the collected cerebrospinal fluid will contain blood and could be discolored yellow, caused by the presence of breakdown products of the blood cells. Other more sophisticated tests can also be performed to confirm the presence of blood and its breakdown products in the sample. The definitive test for a cerebral aneurysm is a fluoroscopic angiogram, as it can often directly document the aneurysm, particularly its location and size. This procedure involves the placement of fluorescent material into the vein or artery of concern that increases the contrast between vessels and surrounding tissue so that their path can be clearly seen. The vessel is accessed through the insertion of a catheter in the femoral (leg) artery and threading it through the heart and into the blood vessels of the brain. A microcatheter is threaded through the larger one and used to deliver the contrast material to the precise location of the suspected aneurysm. Digital subtraction removes the bony structures from the image and leaves only the vessels. Generally, when SAH is suspected, a full cerebral angiogram that studies all four of the major cerebral arteries is performed. Modern angiograms are able to identify 85% of all cerebral aneurysms, with another 10% visible upon a second test seven to 10 days later. If this test is negative, magnetic resonance imagining (MRI), which is in some ways a more sensitive test, is often recommended. If an aneurysm presents without rupture, some symptoms include seizures, double vision, progressive blindness in one eye, numbness on one side of the face, difficulty speaking, or, occasionally, hydrocephalus (accumulation of cerebrospinal fluid in the brain). Because of the sensitivity of available scanning techniques (particularly MRI), many aneurysms are discovered even before symptoms develop. This raises the issue of whether non-ruptured, asymptomatic aneurysms should be surgically treated. Many health professionals view an unruptured aneurysm as a potential time bomb. In general, there is a 3% per year cumulative risk of rupture once an aneurysm is identified, or stated another way, about 0.5–0.75% of all aneurysms rupture each year. Each rupture brings with it the very high probability of serious neurological damage or even death. Furthermore, there are certain aneurysms that rupture more commonly than others, and environmental factors such as smoking and high blood pressure contribute to these events. However, all other things being equal, research indicates that by 10 years after diagnosis, there is an approximately 30% chance the aneurysm will rupture. Yet, the surgery itself carries significant risk. Whether or not to treat an unruptured aneurysm is a difficult decision and should be made only after careful consideration of the many influencing factors. After diagnosis with a cerebral aneurysm, a patient will be put on strict bed rest and receive medication to avoid complications, keep blood pressure under control, and for pain relief. The exact timing for surgical treatment of cerebral aneurysms is historically a controversial subject in neurosurgery and is dependent on many factors including patient age, aneurysm size, aneurysm location, density of SAH, and whether the patient is comatose. Research indicates that early treatment, within the first 48 hours after hemorrhage, is generally associated with better outcomes, particularly because of the reduction of two serious complications of rupture: re-bleeding and vasospasm. Re-bleeding is the most important cause of death if a patient survives the initial bleed and will happen in approximately 50% of all patients with a ruptured aneurysm who do not undergo surgical treatment. The peak occurrence of re-bleeding is within the first few days after rupture. About 60% of patients who re-bleed die. The second major cause of death after rupture is vasospasm, a condition where the arteries at the base of the brain become irritated and constrict so tightly that blood cannot flow to critical brain regions. This spasm may result in further brain damage or induce re-bleeding, and much of the medical treatment after the aneurysm ruptures and prior to surgical treatment is designed to prevent this complication. 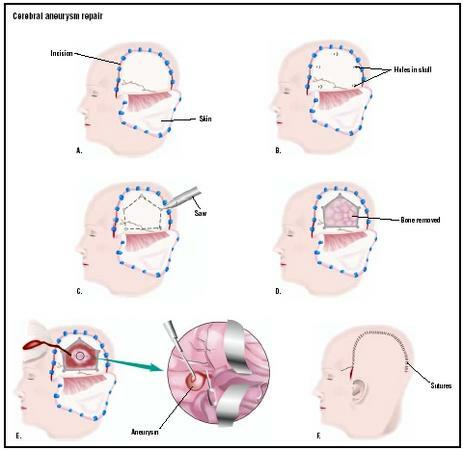 The procedure itself begins with general anesthesia of the patient and shaving of the area of the skull where the craniotomy , or opening of the skull bone, will occur. The exact position of the opening depends on the approach that the neurosurgeon will use to reach the aneurysm. The approach varies with the exact location of the aneurysm within the brain's cardiovascular system. Once the bone flap is removed, the various layers of tissue are cut away to expose the brain. Blocking brain tissue is gently retracted back to expose the area containing the abnormal vessel formation. Surgical techniques performed through a microscope are then utilized to dissect the aneurysm away from the feeding vessels and expose the neck to receive the clip. Clips are manufactured in various types, sizes, shapes, and lengths to accommodate the needs for the various positions, shapes, and sizes of aneurysms. Clips are made of different kinds of materials, with titanium being popular because the material will not interfere with later magnetic resonance imaging (MRI) testing. The clip is placed on the neck of the aneurysm in order to isolate it from the normal circulation. Careful clip placement will stop the flow of blood into the aneurysm, causing it to deflate or obliterate. Proper placement causes aneurysm obliteration and avoids damage to the adjacent vessels or their branches. Once the clip is in place, the brain tissue is carefully lowered back into place, the various layers sutured closed, and the bone flap is reseated for healing. The skin and other outer layers are also sutured closed. Bandages protect the area during healing. Many times a postoperative angiogram is performed to confirm good clip placement, total obliteration of the aneurysm, and continued blood flow through the neighboring vessels. Because of the unpredictable nature of vessel behavior and the individual structure of each aneurysm, unexpected findings are seen in approximately 19% of postoperative angiograms. Patients stay in the hospital an average of 9.3 days after this procedure. A major risk during surgery is a second rupture of the aneurysm during the procedure. Intraoperative rupture is very serious and associated with an approximately 30–35% morbidity and mortality of the patient. It is particularly dangerous if it occurs during the administration of the anesthesia or the opening of the dura mater because there will be a delay before the surgeon can control the bleeding. Although much rarer than without surgical treatment, re-bleeding can occur even after surgery, particularly with improper placement of the clip. If too close to the parent vessel, the clip can block blood flow and promote brain damage in that area. If it is too far away from the parent vessel, a condition known as an aneurysmal rest can develop that will swell and rupture later. This rebleeding can also be described as a stroke, and occurs in between 1% and 10% of surgical patients. Again rarer than without treatment, patients having their aneurysm clipped can also develop vasospasm after the procedure. The presence of vasospasm increases the occurrence of re-bleeding as well, making it a particularly dangerous complication. Treatments for vasospasm include giving medications that relax the smooth muscles in vessel walls, administering intravenous fluids to increase blood volume, or using drugs to increase blood pressure. In some cases, it may be necessary to open the vessel with a balloon catheter, a procedure called angioplasty . Angioplasty carries with it its own significant risks, including the formation of blood clots and rupture of the artery, and is effective only in some cases. Other risks of the surgical treatment of cerebral aneurysms include neurological damage over and above what had occurred with the rupture. Special surgical procedures such as the use of temporary clips on the parent vessel, reduction of the patient's blood pressure, and administration of drugs that increase the brain tissue's ability to survive without oxygen are some techniques that minimize the amount of damage. Hypothermia (reduction of the patient's temperature during surgery) is sometimes also utilized to reduce the chance of this risk. As this surgery involves opening of the cranium (skull), the procedure carries an increased risk of infection of brain and spinal tissues. This surgery also has all the risks of any other invasive procedure, such as infection at the incision site, and risks associated with anesthesia. If the postoperative angiogram indicates the clip has been properly placed, the aneurysm has been totally obliterated, and vasospasm is avoided, most patients do extremely well. However, the results of the surgery are always limited by the amount of neurological damage that occurred with the rupture itself, as much of the damage is nonreversible with current treatment methods. This issue is not a consideration with elective repair of a pre-rupture aneurysm. Despite advances in microsurgery , anesthetic techniques, and critical care, the morbidity and mortality rates of SAH remains high at 25–35% and 40–50%, respectively. Age and neurologic status on hospital admission continue to be the best predictors of outcome. In contrast, the operative mortality rate for elective clipping is close to 0, with morbidity ranging between 0% and 10%, especially if the surgeon is experienced in the procedure and utilizes the latest microsurgical techniques. In this situation, morbidity is most closely related to aneurysm size and location. Generally, elective clipping of an unruptured aneurysm is associated with better outcomes than ruptured aneurysms because the brain has not been damaged by the SAH prior to the procedure. A promising new alternative to open surgery is the use of inventional neuroradiology to treat aneurysms. The greatest advantages to this technique are that it is less invasive and requires less recovery time in most patients. This technique is also more effective than craniotomy for certain positions of aneurysms or for patients that have complicating conditions that would make them unable to tolerate the stress of the more traditional surgery. The decision of whether an aneurysm should be treated surgically with a clip or through inventional neuroradiological techniques should be made as a team by the neurosurgeon and the endovascular radiologist. Inventional neuroradiology, also known as endovascular neuroradiology, utilizes fluoroscopic angiography , described as a diagnostic imaging technique. Besides delivering the contrast material, the catheter can be used to place small coils, known as Gugliemlimi detachable coils, within the neck of the aneurysm using a delivery wire. Once the coil has been maneuvered into place, an electrical charge is sent through the delivery wire. This charge disintegrates the stainless steel of the coil, separating it from the delivery wire, which is removed from the body, leaving the coil. Anywhere from one to 30 coils may be necessary to block the neck of the aneurysm from the normal circulation and obliterate it, as occurs with the clip procedure. Although more research is needed to compare the two procedures, recent results indicate that intervention surgery for ruptured aneurysms may be safer than the traditionally more invasive procedure and may increase the chances of survival without disability after SAH. Aldrich, E. Francois, et al. "Neurosurgery." In Textbook of Surgery, edited by Courtney m. Townsend. Philadelphia: W.B. Saunders Company, 2001. Hoff, Julian T. and Michael F. Boland. "Neurosurgery." In Principles of Surgery, Vol. 2, edited by Seymour I. Schwartz. New York: McGraw-Hill, 1999. "International Subarachnoid Aneurysm Trial (ISAT) of Neurosurgical Clipping versus Endovascular Coiling in 2143 Patients with Ruptured Intracranial Aneurysms: A Randomised Trial." The Lancet 360, no. 9342 (October 2002): 1267. Pope, Wendi L. "Cerebral Vessel Repair with Coils & Glue." Nursing (July 2002): 47–49. American Association of Neurological Surgeons. http://www.aans.org . American Society of Interventional and Therapeutic Neuroradiology. http://www.asitn.org . Greenberg, Mark S. Handbook of Neurosurgery, 1997 [cited March 1, 2003]. http://www.grgraphics.com/site/HBNS/chapters/SAH/SAH_001.html . Surgical repair of cerebral aneurysms is performed by neurosurgeons who specialize in this procedure. It is performed in a hospital. Inventional radiology is performed by an endovascular radiologist and is also performed in a hospital. What are the risks of treatment of my aneurysm? What are the chances of recovery using this surgical treatment method? What are the risks if the aneurysm is left to heal on its own? What are the specific characteristics of my aneurysm and how does this affect the decision to treat the problem? Is inventional radiology a possible means of treating my aneurysm? How long is the recovery time for Inventional neuroradiology, also known as endovascular neuroradiology using the coliling process ? My sister has just been diagnosed with a cerebral aneurysm - frontal lobe. She is 52 years old and has had rheumatoid arthritis since the age of 19. Her physician has ordered a CT scan and told her to stay as immobile as possible. We do not have a history of aneurysms in our family. However, our mother died two years ago with all blood cut off to her liver. Something about artery degeneration. Can this be a connection? My sister is healthy, she jogs and works; is married with two lovely children and of course; the love of my life. Thank You this is really great information that I raelly needed.My mother died due to an ruptured aneurysm,and I wanted more info on the surgery she had as an emergency. I had a craniotomy six weeks ago to clip my aneurysm which did not rupture. It measured 11mm. I continue to get severe headaches, mainly upon awakening in the morning, and after driving the car or other rapid motion visual stimulation. I am also having difficulty with my short term memory, and some confusion because of this. I am a 38 year old female with polycystic kidney disease with 30% function. Thank you for the informative article. My wife 32 suffered a ruptured brain aneurysm and miraculously survived. The anurysm was clipped in the Rush University Hispital (Chicago). She was resumed normal life as a PhD student and has recovered 100%. I had an aneurysm clip in December, 2007. We discovered the aneurysm during an MRI due to neck pain. I had no headaches or other signs. Now, I'm doing pretty well after going through having to remember how to hold a pencil, write my name,and other quirky things. Lately, however, I am experiencing headaches, pressure in my temples and dizziness. I've had it before in the last two years but usually it would just come and go. Now, it stays with me and when I get home from work I have to go and lay down for a while before preparing dinner or performing other normal activity. Please help me understand what's happening. Thanks so much. Could anyone tell me what happens if an aneurysm starts to bleed again after it has been coiled? My wife who had this procedure done last year has had a check up done last week and the consultant said they will just keep an eye on how the bleeding is progressing. I am not happy with this and I feel that the aneurysm should be topped up with extra coiling before something more serious happens. Can anyone answer my question please? My Gram was just diagnosed with a brain aneurysm. They told her she had 6 months to a year to live. And if she keeps smoking it will be shorter than that. They said they can do the surgery but we are scared of how she is going to some out of it. They say there are very severe side effects from the surgery is this true? nd is smoking really making her worse? I'm 14. My aunt was sitting around one day and then she had tight pains in her chest. they rushed to the hospital thinking it was a heart attack. Then she was rushed somewhere wlsr and the doctors found a blood clot in her arm and 4 aneurysm's. She has surjury scedualed. I want to know everything about it. I'm scared. Will she live? please e-mail me with information. please! i'm 14 and scared. thank you.. I had an front lobe cerebral aneurysm, well I had a headache for 9 to 10 Days and I didn't dare take anything. Because I never had headaches. Well, on the 9 day I went to a hospital and explain my symtoms as worst headache left eye hurting feeling like i am dying, not able to stand T.V. light. The hospital did a Cat scan and found nothing gave me motrin then 1 hour later they gave me advil. They aiso gave me medicine to raise my Dilantin level.and they sent me home. No they didn't call a neourogist. The next night which was Sunday, I went to another hospital and they did a cat scan foud nothing and told me it seem like I migh have sinasitis. On Monday I found me a neourolgist and he listen to the same symtoms and gave me meds. In an I.V. to bring the swelling down and stop the pain then the next day he did an MRI on Thursday he call me up to tell me it was an anereusyn and I was to get to the hospital right away and. And he would be there.He and a doctor he trusted did my surgery and as u see it was a sucess. At this point in my life I can only say what I know Thank u Jesus. For keeping a fence around me and blessing me with the best doctors.I go tomorrow because I have headaches and my left eye hurts and I know they will take care of me because I trust God. You know your body always pay attention to changes and never stop asking questions. My mother just had the coil procedure for her 11mm aneurysm. Its been 15 days and after seeing great improvement, today she is experiencing pain in the area where her aneurysm was (her procedure was done vascularyly) and is extremely nauseous. Her memory of what happened after surgery or what she discussed with the Dr.'s is minimal and coming back slowly. She is finally able to eat and has been going to the bathroom sparatically. Its almost as if she has the flu. What are the post op systems we need to watch for? At what point do we need to suggest she may need urgent care. Her post op follow-up isn't for another week and a half. I found this very helpful. I am 14 years post rupture brIn aneurysm frontal lobe. I did extremely well considering. Dr Aldrich was great in clipping at the U of Maryland. When The aneurysm rupture I fell and hit the back of my head on a marble floor. I continue to have pain in the back of my head and it has nee and the last week. I think I injured the back of my brain when I fell. Any advice would be appreciated. my daughter being diagnosed with aneurysm and it is located inside her brain with 2.5inches depth. she had her surgery using SRS sterostatic radiosurgery. my question is how many percent that the burst arteries being repaired and is there any side effect after the SRS? I had the coiling about 7 months ago. I've gone back for CT scan, MRI, and angiogram. So far, all is well. It runs in my family. Now my sister has found out that she has a small unruptured aneurysm. There is nothing definitive yet as to what procedure the will do. Mine had ruptured. I'm really worried about my sister. I think they may have to do the clipping. Her aneurysm is at the bottom of her brain. Mine was a subarachnoid hemorrhage, between the layers on the outer brain. My dad just had clipping done on his anuerysm tuesday, it was the size of a ping pong ball in the frontal lobe. 20 years ago he had a crainiotomy done due to trauma from a wreck. He was awake the day after that surgery..eyes open and alert. We are very worried because it is now thursday and he will not open his eyes or move much. He still carries conversations when started but does not just start talking. The neuro dr said that all the scans show that everything is fine and he should have been opening his eyes and moving already. Can anyone tell me if this could be a problem? My mother is not doing well , thinking he will never fully wake up. My Brother on 12/02/2011 had a Aneurysm on his frontal lobe of his brain rupture. They life flighted him to KU Medical in Kansas City, Kansas for emergency craniotomy surgery to remove bloob clots and clip the aneurysm. He made it through the surgery and is stable. He follows comands sometimes but not always. He is not moving the right side of his body very good at all and most of the time not at all. It has been four days since the surgery and has not had any vasospasms. so my Question for anyone that would be able to answer it is. What is his chances of surviving this and living a somewhat normal life? Or is the hope of him living a somewhat normal life being unrealistic? In 1996 at the age of 31 and the mother of four my youngest being 3 at the time, I suffered a ruptured anuerysm In The brain which had been bleeding for some time I successfully had it clipped and was extremely lucky that the one side effect from the operAtion was double.vison which I now wear a contact lense to black that out. In 2010 while stopped in my full sized pickup truck waiting for a school bus to disembark children I was hit from behind by another pick up truck at the police estimated speed of 80 + km per hour. At instant of impact I experienced the "worst headache of my life by far", I was disoriented and dizzy. When ambulance attendants took my blood pressure it was 286/146. I was given a ct scan in emerg and an berry aneurysm was found at that time measuring 9mm. I also noted, and still have left sided hearing loss that I perceived in ICU, and continues to this day. My question is: Is there any chance that my aneurysm was CAUSED by the extreme blood pressure after initial impact. Repair of the aneurysm was recommended by a neurosurgeon which I declined at that time but may yet reconsider. No near relatives have had diagnosed aneurysms. I also have had many symptoms of traumatic brain injury, such as constant headache,very sore scalp for 6 months post accident, left eye retinal tearing with blood plumes x 2 with surgical repair both times, L. eye pain, dizziness, forgetfulness, sleep disorder (insomnia), emotional lability.etc. These symptoms have occurred since the accident. I thank you so much for your learned opinion on this matter. i am 32 and in the recovery process after having a clot and bleeding on my brain, after loosing my memory and not being able to walk i finally made it to the stage where the surgeon discharged me, but my recent angiogram showed a 2nd aneurysm so back under the care of the surgeon. it was only 4 months ago i had the 1st one and have been told i nearly died, i cant remember anything about what happened and the 2nd finding has me scared, i have 3 small children and im worried i will go to bed one night and not wake up, i guess if they were worried about the 2nd one i would have been in surgery by now but good old google searches say that nearly any size can be fatal im getting headaches and dizzyness i cant walk in a straight line and think im getting myself in a bit of a state now but its ony because i know im lucky to have survived the 1st one. my father has a ruptured saccular aneurysm.doctors are sayig that clipping is needed.he is unaware of surroundings and has occasional memory loss.will he be able to back to normal life after the clipping is done?if, how much time will it take? I am a 51 year old female. 8 Months ago I had a brain aneurysm. I had the Vascular Coiling procedure done. I left the day after the procedure and felt absolutely fine. 4 days ago I had to go back in to have an angiogram to see how the procedure did. Dr.said it looks great, the coils are still there and If no complications arise see you in five years.Im just wondering though since I had the angiogram I have been struggling with memory alot. I will be talking and forget what im saying or cant remember what I was doing. I was doing fine before this. Is that normal. I had an anuerysm tht was clipped 3 1/2 weeks ago and as soon as they take me off of the steroids my face swells and I get the worse headaches. They have placed me back on the steroids 3 times. As soon as I take them I feel great. Is this normal ? In 1998 I had a double brain aneurysm and was coiled at St. Lukes on the Plaza. Is there any after care or therapy I can get to help me? At that time there seemed to be none. I do live by myself as I did then, so if help was available to me I have no memory of being told. I was on disability until I just got OLD! I am 68 yr. now and have limitations which no one can SEE except I know that they are there. I still have problems with learning new material quickly as well as anxiety when facing problems. I was left with weakness in my lower extremities and could not read for several years, but I now can read and retain information. Is there a place where I can go to discuss my issues on this? I had an aneurism clipped 23 years ago two pins and cotton had to be removed ten years later. Does anyone know the long term consiqeses of having a clip in my brain ? Aged 45 in 2008, I had the worst headache caused by a ruptured artery on the brain frontal lobe. Undergone a 5.5 hours surgery on that day followed bz angioplastz after 10 days. All praises and glory back to our GOD for I am living a normal life after a month of stay in the hospital. When you have that faith in GOD, HE designates and uses medical people to execute full and complete healing to this kind of illness. GOD guided and provides wisdom to all the medical staff involved. In our GOD everything that is impossible with humans are possible. God bless all of you. I'm 50 years old, and I made it through 3 aneurysms. Hospitalized in July of this year, discharged Aug. 2nd. One of my aneurysms was clipped, the other was wrapped, and the third one is untreated at this time, though I'm due for another angiogram this month. If it hadn't been for my amazing doctors I wouldn't have made it, wouldn't have made it to my 50th birthday, wouldn't have been alive to see my newborn great niece and nephew. My head feels funky at times--no headaches. Also, I didn't have to have any kind of therapy. I could walk, talk, see,and remember (beginning 5 days before discharge). God is looking out for each and everyone of you. I know he blessed me with the doctors he gave me. Yes, bless Docs. Rusyniak and Cordino. My aneurysm surgery was 4 years ago I had a 2 clips inserted at U.of M. hospital in 2009. I still experience headaches & dizziness, but my concern is with how lumpy my skull is when a headache happens it feels like a my skull is pulsing with pain and i can feel a hard lump where the skull was cut. The insecion was from the top of my ear horseshoe shaped to my forehead. Should I be worried? I HAD ANEURYSM SURGERY APRIL 4,2013 AT 7:30 A.M.I AM 65 YEARS OLD.I HAVE A FEW HEADACHES.I HEELED VERY GOOD AND FAST FROM MY SURGERY,IT IS NOW 2MONTHS AND 4 DAYS AND I AM HAVING A PROMBLEM A SPOT WERE I WAS CUT IS NOW CAVING IN ALITTLE .I AM VERY WORRIED AND CONCERNED AND SCARED.I WILL HAVE TO CALL MY DOCTOR ON MONDAY.GOOD LUCK TO EVERYONE AND ENJOY YOUR LIVE. After having my anuerysm coiled in 2011, I am still left with many effects, behavour anger has changed i fly off the handle a lot it has effected me in how i interact with people around me. I have had no support from GPs hospital, only had one follow up scan to chech everything is still in place, no blood pressure taken or colestreol chech, I feel like ive been forgotten about, carnt get back into work. my concentration level is near zero i forget information and what im doing. I have spoken to my doctor and he put it down to depression not to mention the constant ach in my groin. i need advice can anyone help? It been, since 2011 and my vision is Un-describable. All I know is I have an undecribable headaches, eyesight is challenging. Balance is off and I can't remember what day it is upon awaking in the morning and I forget, what you said 5 minutes ago, and I never let, anyone know that I am having the forgetfulness issue. Because everybody always say uplifting things like I didn'thave surgery but I too forget. And it's good encouragement to but not it's serious. My father had the aneurysm clipping on November 2014, he recovered well but still having insomnia after the surgery. I want to ask, in most cases, how long does it take to recover from the post surgery side effects? Had an aneurysm clipped the size of 10 cm with blisters around it was found by accident had a bad infection on my tonsils that caused me to go to the Dr where a ct scan was done and that's how they found it after going to all kinds of testing clipping was my only option I am a 67 year old female no other medical condition on no medication no high blood pressure never been sick before so this was all new to me but I have to say I am a very lucky lady today. My head feels funny at times and I wonder if I'm going to have headaches when all the numbness is gone it has been 12 weeks already my Neuro says I can resume all my activities was just wondering should I be worry about anything. I feel like myself except not having any sinus headaches anymore. had a ruptered aneurysm on 5th july and survived it with the quick actions of my wonderful 13yr old daughter who acted quick and phoned the ambulance my mam died of the same thing 6 years ago when they operated they removed part of my skull and clipped the aneurysm but they have put that part of the skull in my stomach i have been home since the 28th july i have been trying to look for information on what happens when they put the piece of skull back in has anyone else had this? Thank you, my son born with NF1, has had two aneurysms. The first was trapped and bypassed, the second coiled. Then he had Moyamoya. I have EDS Hypermobility and feel they him and my other son do as well and was wondering if that gave him a higher chance of having the aneurysms. I was told it was due to NF1, but my Hypermobility diagnosis came after his aneurysm so I haven't gotten to bring up to his neurosurgern as of yet. I will in our next visit. Not related but I also need to get tested for gardeners or at least checked for cancer since it runs high on both my maternal and paternal. With my son having NF1, it scares me that he can get cancer on top of that. If it's me I don't mind, but him he has gone through enough. Thank you again. I have an aneurysm on my right midle cerebral artery. It was coiled twice unsuccessfully. I then saw another surgeon who recommended clipping. Unfortunately that was not possible due to a calcified neck & protrusion of coils, the aneurysm was wrapped with muslin gauze & I have made a good recovery & am back at work. I am however worried, having heard about foreign body induced muslinoma & gauzoma caused by the muslin. I cannot find any article devoted to aneurysm wrapping with muslin. Any direction or sharing of similar experience would be great. I had an aneurysm in the circle of willis and since than my most vivid dreams make my head throb like crazy when I wake.only on the side of my surgery. I feel like it is too much for my brain to take. Is is possible for an aneurysm clip to come loose. I had a CT scan recently & the result came back as no aneurysmal identified & suggested I go for a CT angiogram examination. My clip was placed 6 years ago during a brain tumour removal op. Since then I have had regular CT's & it has always shown up. My aneurysm was 3mm at time of clipping. I don't get headaches a lot , but am getting dizzy spells. My husband has undergone surgery subarachoid anuresym clipping has been fixed. I wanted to know how fast he will recover. He had swelling after the surgery and bone flopping was done. But his condition is no movement in the arm and leg and no speech.and still in the ICU. He had his surgery 10 days back. Can you please tell me how his improvement will be and what should I do to improve his movements and speech. He doesn't have numbness but when we pinch very hard he responds.